"Between the dates 1119 and 1540, I find the name of this conspicuous hill written Otneberch, Ohtnebercg, Othenbruche, Othenesbergh, Ornbach, Ounsbery, Onesbergh, and, more corruptly, Hensberg (1119), Hogtenberg, Thuerbrugh, Thuerbrught, all (expect the last two) manifest corruptions of an original Odinberg (a name which could only have been imposed by the Danes), but never written Roseberry." I was particularly interested in the last two names, given the book about Thorn Worship that I’d been reading (see previous post). Maybe both these names are corruptions of Thor or Thorn. 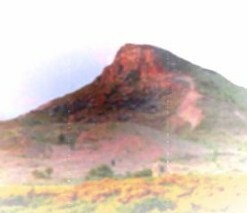 Plus, Roseberry Topping does look somewhat thorn-shaped. Phonetically, the "Thue" sounds like Tew. This could tie-in with your March 2013 post? That's a good spot, I'd never noticed that one. I like the idea of mixing the Tew stuff with Roseberry Topping :) I wonder if there are any other links between the two.